It’s a common practice in various kinds of business for documents to be double-checked and approved by the responsible people before they are signed. But sometimes it happens that this step is somehow missed and may cause unwanted issues. That being said, we’ve just introduced a new feature — approvals — that can simplify this process. Internal approvals are well-known in sales, procurement, risk management, IT and many other departments. For example, sales contracts with the exceeding value of a certain set sum normally need approvals from higher managers or risk management departments, purchasing agreements usually signed by purchasing managers need approvals from procurement or other related departments, handover/acceptance certificates in the IT or other departments also need to be approved before signing. You could probably think of many more examples that you face in your own company. If you can relate to any of the mentioned situations, our new feature can help you simplify approval processes that can sometimes be painful in many senses. Approvals allow you to add additional consent to the documents inside your organisation. This can make sure that the content or other information in the document is viewed and confirmed by the responsible person before signing, thus, avoiding situations and faults when the documents are shared with other parties without internal consent. Besides, confirming documents before sending them to sign and other parties actually putting signatures on them prevents you from repeating the same process all over again in case you notice any inaccuracy in a document after it is signed by another party, e.g., your client or partner. In other words, your internal approval processes before proceeding to signing procedure will be simplified and in order, so no one misses their role. Approvals are the simplest way to ensure reliability and compliance to company policies. This feature can be extremely helpful for the above-mentioned teams like procurement, sales, etc. and in other cases it can come in handy in big organisations where documents travel through several departments and need to be checked and approved by different responsible people before sending them out. 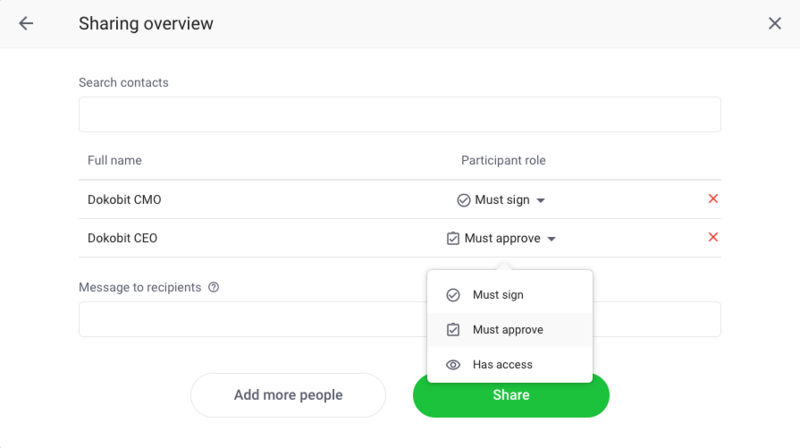 When adding participants with whom you want to share a document, you simply change their role — instead of Must sign or Has access you choose Must approve. Then the person receives an email notification that they’ve been invited to Review and approve the document. When they log in, they only see Approve button instead of Sign. When approved, you will see the information as usual — in the people’s list there will be all the necessary information: approver’s name, company, position and time when the document was approved. What is more, approvals are invisible on the documents, they are not recorded in any way contrary to signatures. It is also possible to hide approvals from the signing parties outside your organisation from the people’ list and audit trail and keep them only in the organisation as an internal process. Thus, you can be calm that the third parties only see the signing part of the entire document journey. In addition to all the cool stuff approvals provide, this feature can also be combined with the other ones, e.g., categories. Just as with other user roles Must sign or Has access, you can set it to Must approve to the documents assigned to certain categories, thus, automatically appointing particular people to all the documents in that category. For example, you’ve created a category SMEs sales contracts and you’ve set that all the documents in the category must be signed by a sales manager responsible for SMEs. Well, now you can also set that all the documents in this category before signing must be approved by a risk management specialist. Thus, when assigning the mentioned category to the uploaded document, it will automatically select signer and approver and send notifications with the required actions for both, meaning you won’t have to add these people by hand each time you add a document to that category. Soon, there will be more perks related to approvals’ combination with other features, so stay tuned!